Sections are the units within a module. Each module can consist of one or more sections. From the Author View page, check the box next to the title of the module you want to add a section to, and then click the Add Content link at the top. From the Author View page, check the box next to an existing section in the module you want to add a section to, and then click the Add Content link at the top. After you are finished editing a section, click the Add Section link just below the top navigation bar to add another section to the module. After adding a new module, click the Add Content Sections link that is displayed in the confirmation page to add another section to the module. Most special characters are allowed, but not the # sign. 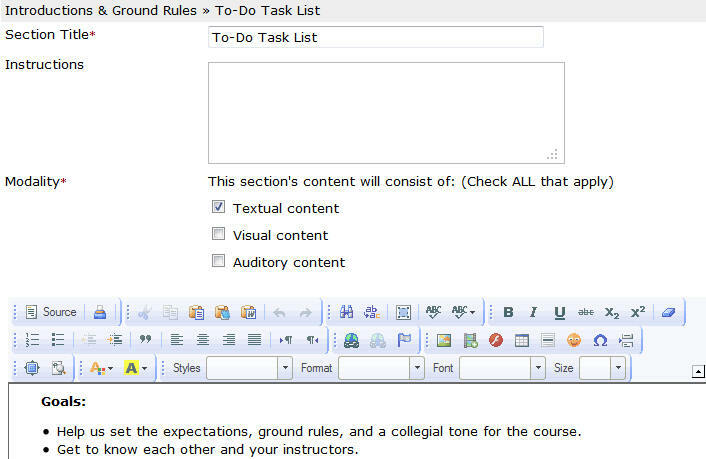 After typing the title and instructions, choose the modality of the section’s content. (This is optional. It is metadata that will be used later by a search engine). 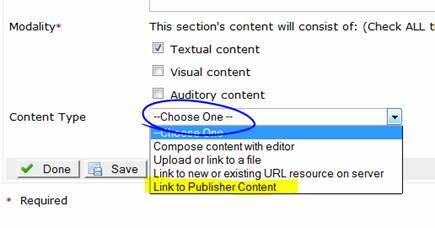 This option allows you to create a content section that consists of one file. Uploaded files are generally downloaded onto the student’s computer, not opened directly into the system. Select “Upload or link to a file” from the drop-down menu, and click on Select. Then, browse to select a file from your computer. A section’s content can be an uploaded Word, Excel, pdf, etc. file. Or, if you want to use a previously-uploaded file, click on “link to me” to the right of the file you want to use (see list of your uploads below the browse area). Once you find your file and select it, click on Continue. You will be taken back to the edit section page. You will see your uploaded file name. You can click on View, if you’d like, to preview it. Click on Done at the bottom to save your new section and return to the table of contents. How uploaded files are opened or downloaded onto students’ computers depends on their browser’s settings. For example, when clicking on a link that is an uploaded Word file, the browser may ask you if you want to open the file or if you want to save it to the desktop. But, if you click on a link that is a pdf file, the browser may open it immediately, without prompting. Your students will have similar experiences. If the uploaded document is a .docx file, the student must have an application that opens it, such as Word. If the uploaded document is a .xlsx file, the student must have Excel or some other program that opens Excel documents. If you are going to use uploaded documents, you may want to mention the type of software needed to open these files as a requirement in your syllabus. As the instructor, you have no control over how students configure their browsers, and if they use more than one computer, these files may be handled differently on each computer. Another option for adding content to a section is by linking to a web page that exists on the web (must be a functional URL). When a student goes to a section that is a link to a web page, there will be a link directly on that page. Enter the complete URL, including the http:// or https:// and a title the describes the website. If the URL has an insecure address (i.e. http as opposed to https), check “Open in new window”. To use a link that you have already set up for another module, click on Browse Server. Then, click on link to me to use an existing link. 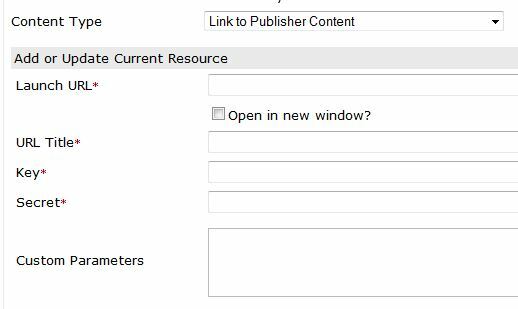 This option allows you to link to publisher content. You must get the Launch URL, key, and secret from your publisher. 1. To enable this option, click on Modules and then on Preferences at the menu bar. 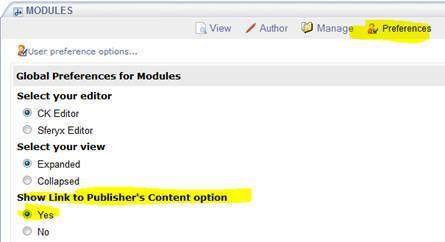 3.Once this option is enabled, click on Author and add a module to add a link to your publisher’s content. To do so, click on Add Module >> Add a title >> Click on Add Content Sections >> Add a title for the section. 4.Under Content Type, choose the last option for publisher content. 5. Click on “Select”. This will take you to a view to enter the Launch URL, etc. Enter the required information provided by your publisher. 6.Click on Continue and Done.